Hearty portions of traditional Italian favorites are the foundation for the recently reopened Matteo’s Trattoria and Bar. Foodies looking to enjoy a taste of Italy in a newly renovated and modern atmosphere are sure to enjoy Matteo’s of Huntington. The Italian eatery on Jericho Turnpike in Huntington Station is part of the Rothmann’s Restaurant Group, which also includes Rothmann’s Steakhouse in East Norwich, Matteo’s of Roslyn and two other Matteo’s locations in Florida. The Huntington Station restaurant reopened a little over a month ago, and floor manager Vincent Lorusso said that hungry customers have been excited to see both the new menu and décor. Lorusso said the around 200-seat restaurant is the “perfect place” to host a get together, including holiday parties. “We’ve been doing Christmas party after Christmas party,” Lorusso said. Lorusso described the new décor at the renovated restaurant as a modern, chic adaptation of traditional themes, and the same description also sums up the new menu. That menu features both individual and family style portions for nearly every dish, allowing Foodies to decide what kind of dining experience they want. 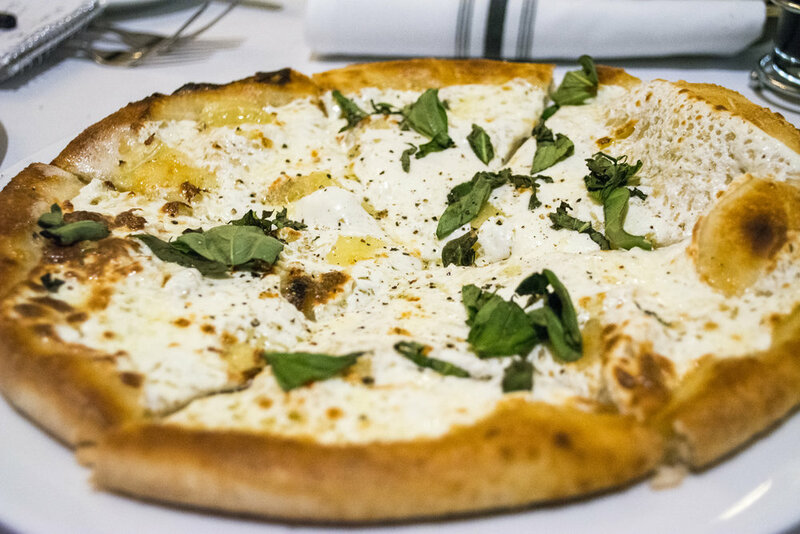 One of the new menu items are a selection of wood fired pizzas including the Robiola ($18.50) that features robiola cheese, mozzarella, basil and truffle oil. The crust has just the right level of crunch on the outside, while still maintaining a soft fluffy texture on the inside. The creamy cheese and truffle oil add an almost buttery taste that serves to elevate and refine this pizza. As expected, Matteo’s menu features a wide variety of freshly made pastas with almost every style of sauce, but diners looking to enjoy the great Italian flavors without the carbs should try the Zucchini Linguine ($18 individual portion; $28 family style). The fresh zucchini is shaped to look like pasta, and served with filetto di pomodoro sauce. The strings of zucchini take the place of linguine in this unique take on linguine with red sauce. The flavorful sauce does not overpower the taste or the crunchy texture of the zucchini. 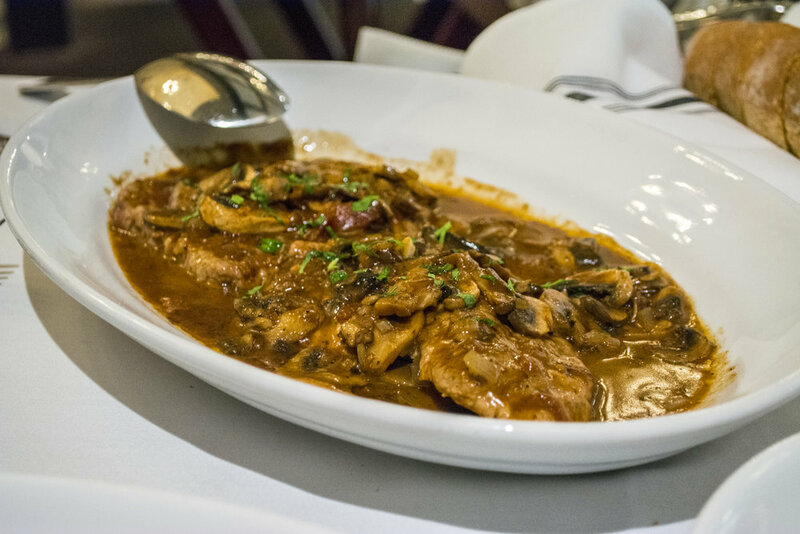 For a main course, Veal Marsala ($24/$33) is served with mushrooms and a Marsala wine sauce. Matteo’s excels at this traditional Italian dish. The veal soaks in the flavor of the brown wine sauce, and the mushrooms add an earthy taste and texture to the dish. The thin pieces of veal are cooked perfectly, making this a great dish to share with the table. One of the restaurant’s signature dishes is the Chicken Matteo ($26/$39) served with a heaping portion of sausage, onions, peppers, broccolini and potatoes. The chicken has a crispy skin that yields tender meat right off of the bone. The dish has a rustic presentation that reminds diners of a traditional Italian family meal. The dish’s two proteins work well together, but the well-cooked vegetables also feature prominently. Every bite of chicken can be paired with a different combination of vegetables that gives the plate a unique depth of flavor and texture. After dinner there are traditional Italian desserts like bombolini and biscotti to enjoy. Served with Nutella and cannoli cream, the light and fluffy Italian style donuts are the perfect way to end a traditional Italian meal. The familiar crunch from the biscotti goes well with the sweetness of the cream and Nutella to cap off a meal full of so many savory flavors.